This is technically correct, but useless: "collegamenti attivi" and "collegamenti, attivi" would appear close together in the index, thus making the index less helpful. This way, the user will be able to find the reference both under "collegamenti" and under "attivi", as in the original English document. Perhaps I'm showing my ignorance here, but wouldn't you get better results by indexing the translation, instead of trying to translate the index? I would think that it would then be easier to check the index of the translation against the index of the English original. 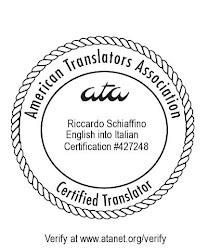 As it is, you will have to check the translated index against the translation, and probably make a lot of corrections to the index as a result. Just wondering why its being done this way. Bear in mind that I was talking about translations of texts that already contain index markers: in most cases, Framemaker mif files to be translated in MS Word. So the translator has to translate the existing index entries, and, as far as I know, there is no possibility of adding or removing them. It could be different if the translator worked directly in Framemaker, where one could add index entries to the translation (or remove existing ones). Even so, I believe that would be a separate and additional task, which is not normally the translator's responsibility.